In May 1983, 14-year-old Cynthia Bigge decided to get super drunk and hang out with her boyfriend on a school night. After her father tracked her down and made her come home, Cynthia passed out in her room. The next morning, a confused Cynthia wakes up in a drunken stupor and notices her family has disappeared without a trace, without even leaving a note or clue behind. Cynthia then spends the next 25 years rebuilding a new life while also trying to figure out what happened to her family. I may have enjoyed this novel more than Fear the Worst, even though it seemed to go at a slightly slower pace. I love how the story is told in first person from Cynthia's husband's point of view, whose name is Terry. Here you have a character who genuinely has no idea what is going on, and who suspects on and off that his wife could be the culprit behind the family's disappearance. I think the story being told according to Terry is quite the unique spin on such an intriguing mystery. Terry, who is an English teacher at his town's high school, isn't at all prepared to handle the mess his wife's family may have been involved in, so his sleuthing is comical and haphazard. I also love his sarcastic wit, which had me laughing out loud several times (I may have said the same about the protagonist in my review for Fear the Worst). For example, toward the beginning of the book, Terry is describing the life he has with his wife and young daughter. He says, "Like I've mentioned, I'm a high school English teacher...so we're not exactly rolling in the dough...our cars are both ten years old, our vacations low-key...we took a trip to Walt Disney World, staying outside the park in a cheap motel in Orlando where you could hear, at two in the morning, some guy in the next room telling his girl to be careful, to ease up on the teeth." Hilarious. Barclay works in tons of subtle hilarity like this throughout the entire book. Love it. I really enjoyed my experience with No Time for Goodbye from beginning to end. I feel that some aspects of the mystery were obvious and easy to solve, but only if you know what to look for. Perhaps the thousands of mysteries I've read in my life have seasoned me up quite a bit. 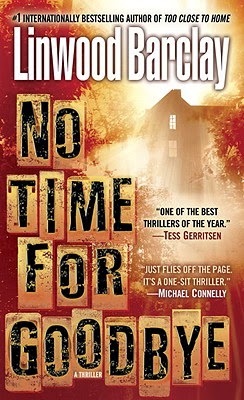 Either way, Linwood Barclay is one of my favorite authors, and I can't wait to read the rest of his novels. Next up on my Barclay reading list is Too Close to Home. I'm so excited! Have you read any of Barclay's novels, and if so, what did you think? Who are your favorite thriller and suspense novelists? Share your comments with us below!